“William Staite Murray emphatically positioned himself as an artist who made pots. He regarded pottery as a genre that offered possibilities for exploring three dimensional form and its graphic treatment, a new discipline, he argued, that was the interface between painting and sculpture. As he stated in a BBC interview in the 1930s with his friend and colleague John Piper, ‘Pottery stands between Painting & Sculpture in the plastic arts, it inclines to either and includes both.’” — Quote from an essay by Julian Stair in Ben Nicholson and Winnifred Nicholson: Art and Life. Click here to read this brief essay in full. SYDNEY, Australia — Our headline is not entirely accurate but it was too good to pass up, although we are the first to introduce an unseen, lost work to the world. To be more accurate, the piece found us via Rhodesia, Africa (now Zimbabwe), Gulgong and then Sydney. I was standing at the opening reception for an exhibition of New Zealand pottery during the Gulgong Clay 2016 conference when a young ceramist, Clare Unger (née Valentine), shyly approached me. What she told me made my blood race. William Staite Murray teaching pottery at Eton. Click to see a larger image. William Staite Murray loading the kiln 1920’s. Click to see a larger image. First a little backstory: William Staite Murray was the greatest ceramist in Britain between the two wars and he was an artist to boot. If you know the name of Bernard Leach but not Murray you have totally flunked British studio pottery history. Murray was Leach’s nemesis in every sense. He began making pots in England before Leach’s return from Japan and, strictly speaking, he should be seen as the prime initiator of the studio pottery movement. He earned glowing reviews from the art critics of The Times and he was an exhibiting member of the prestigious Seven and Five Society that included Barbara Hepworth, Henry Moore, Christopher Wood and Ben Nicholson. Earlier he worked with Vorticist artist Cuthbert Hamilton and made pottery in that jazzy style. Leach also wanted, more than anything else, to be the professor of ceramics at the Royal College of Art in London (yes, Leach wanted to be part of the establishment) but that job, much to his chagrin, went to Murray. Leach’s dislike was such that his apprentices, Michael Cardew and Katherine Pleydell-Bouverie, had to visit his London shows in secret. Both believed Murray’s work to be far superior to that of their master. And they were correct. William Staite Murray was a member of an exclusive group of artists. If you look closely at this page from the studio’s visitors book you will recognize many of the names. Click to see a larger image. To topple Murray from his pedestal, Leach began to question the art critics’ who treated Murray as an artist. Murray was, after all, just a craftsman, he argued and the true test of his work was how well it worked, utility not aesthetics, a safe argument for a dull potter. Aside from the ugliness of this envy-induced mission, Leach was also a hypocrite, selling his pots in Japan for large sums as art. The critics, sadly, were only too happy to take Leach’s kitchen-sink manifesto and turned against Murray. One of Murray’s former admiring critics, Charles Marriott, later mocked him for naming his work saying, “he has lately been in some danger of forgetting that a pot is just a pot.” Leach later expressed regret to Murray going too far, but by then the art door was closed to British ceramics. Bravo Bernard. Kathleen and William Staite Murray at home in England, mid-1903’s. Click to see a larger image. Clare at home in Sydney. Click to see a larger image. William Staite Murray was my father’s great Uncle. He and his wife Kathleen Murray went to Rhodesia in 1939 to visit their niece, my grandmother. She was living with her husband in a farming area called Odzi. My grandparents did not encourage the visit as they feared the outbreak of war and that the Murrays would be stranded in Rhodesia. Despite many letters telling them not to come, they made the journey. When it became clear that they could not return to England, my grandfather built them a cottage on the farm. However, relations between my grandmother and Staite Murray were strained and in 1950 he and Kathleen moved to a house they built in an adjoining farming area. I’m not sure exactly when Staite Murray brought his belongings, including the pots and paintings, now owned by my family, to Rhodesia from England but I assume it was in 1957 when he went back to England to sort out his affairs. He died of cancer in Umtali in 1964. Clare, who emigrated to Australia, inherited the majority of Staite Murray’s pots and all of his papers that survived from her mother. Her aunt, sister and brother, who still live in Zimbabwe, also have some of his creations including pots, paintings and furniture. Claire also has paintings from her mother as well as items that he must have collected before arriving in Rhodesia. These include a medieval jug (which is by itself the touchstone for Murray’s aesthetic with its overstated foot and determined throwing rings), a 16th century statue of Buddha and a small Korean bowl. European Medieval Stoneware Jug. Click to see a larger image. The papers were fascinating, but with them came two books, which to ceramic geeks are most revealing. These appear to be his major sources for glazes and glaze science, dog eared, stained and falling apart: E.I Raes’ The Glazer’s Book: How to Use It, published by the Brick and Pottery Trades Journal Office, and the first edition of Charles Fergus Binns’ The Potter’s Craft (1910). This may have given rise to the first use of the phrase “studio pottery.” In it Binns referred to “studio work” and the “artist potter,” perhaps encouraging Murray in his pursuit of pottery as an art form. His later paintings, for a man who was close to Ben Nicholson and other innovative artists, are ordinary in every sense of the term. Clare has examined the work of the husband and wife closely and while they both painted similar still life subjects she has come to believe that identifying the two artists’ work (few were signed) comes from looking at the flower arrangements. Kathleen’s were always symmetrical and William’s asymmetrical, tilting to the left. Entering the home of Clare and Tim Unger (and we thank them for their generosity in sharing their collection and a perfect cup of tea with us) was, for a historian, a thrilling moment. Rarely seen outside Unger’s family since 1957, it was like stepping back in time to his farewell exhibition and sale, graciously shown in the Unger home in small clusters. Yes, I have been saving the best for last. 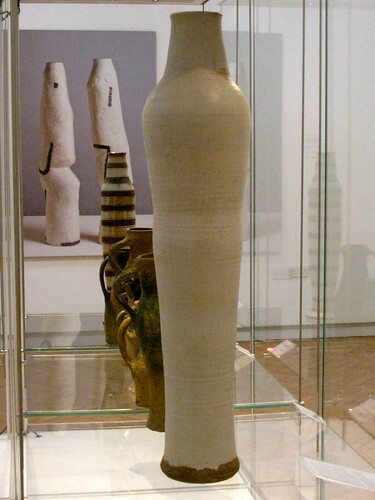 It’s this totemic vase, standing 16 cm (50 inches) high, swirling with glaze mist and it is in many ways (despite its dominant anthropomorphism) surfaced like a traditional Chinese landscape painting, with falling veils of glaze and a subtle, moody palette in beige and grey. The family believed that its tile was Standing Buddha. The movement in the piece is interestingly contradictory, glaze swims down and sideways and the full form swells upward, tugging at each other. For those of us who love pots, the few hours spent with this artwork were enthralling and emotional. However, please accept my apologies for my poor photography, it gives a general sense of the work, but not its full grandeur. I have yet to research the seal but my guess is that the pot was made around 1937-1939. It bears similarity to Murray’s work Kwan-Yin from that period in the collection of the York Art Gallery. The Gallery is a leading resource for British studio pottery (see our story about new collections and the York’s award winning pottery installation) and it is the major repository of Murray’s art with 47 works, most having been gifted by the artist’s loyal and passionate collector the Very Reverend Eric Milner-White, Archbishop of York. Lastly, scroll down for a tantalizing photograph. It appears to be have taken when Murray was a young man, maybe 20 years old, dressed in a costume, and he comes across as a dead ringer for a youthful Oscar Wilde, although that was unlikely to be his intent. Family members heard that he took part in amateur theater early on and maybe he is garbed for a role. Any information from our readers? Bottom line? We know far too little about this man and his life. He is being lost to history while the lesser man, Leach, remains ascendant. Malcolm Haslam’s modest William Staite Murray (London: Crafts Council, 1984) remains the only sourcebook. Time for studio pottery scholarship to raise his profile, examine his art and bring him back to what he was, Britain’s greatest studio potter between the two world wars. And who better for the task than the groundbreaking York Art Gallery? 11 thoughts on "Collector | CFile Discovers Missing Masterpiece by British Potter William Staite Murray in Sydney"
William Staite Murray was my grandfather’s brother. I grew up in Staite Murray’s former home in Bray, England, and used to play in the ruins of his kiln. I helped Malcolm Haslam in a very small way when he was researching his book. I met WSM only once, when he returned to England in 1957, when I was too young to know who he was. I am not an artist myself and most of what I think I know is suspect oral tradition. But I do have a small collection of pots and paintings and my mother, who is eighty-eight, is still alive and totally compos mentis and knows considerably more. I have written to Clare, who must be Mary Valentine’s granddaughter, asking if she would like to compare knowledge. I thoroughly enjoyed your article. William State Murray took studio pottery and made it contempary ,through his students, Heber Mathews next Hans copper ,then his,the rest is history. Mr Leach could not make good pots until William Marshall helped him,Bernard wrote books. Which promoted him. Most potters gave up because of the war. The events surrounding the appointment of Staite Murray to his post at the RCA are interesting because they seem to be undocumented. It is a while since I read Haslam’s book but I don’t recall any sources for this event. Nor could I find anything in the Leach archive or the RCA archive. All accounts appear to be derived from oral tradition. The appointment was made by William Rothenstein, who had come into the RCA as a new broom a few years earlier. His views about the direction of the College are well known. He thought the work in the design department was poor and far behind what he had seen on the continent. He raised the status of painting and replaced full-time teachers with practicing artists of repute who were to have studios in the College and teach part-time. Murray, it is clear, appealed to him as the premier ceramic artist of the age and although he was not a good teacher he was an inspired appointment. I too am a bit disappointed with the remarks that Staite Murray was ‘the greater potter’ and it would have been better to have concluded to have them appreciated in their own light, by their own separate accomplishments. However I do understand that the two have always been compared as a matter of historic consequence. Leach was not the lesser of the two, an unfortunate characterization to say the least, but we have to remember the shortcoming of this remark is coming from someone who usually casts a dissenting and aporetic value onto the role of the handmade pot today. In my view, Leach was not a great technician but much more of a spokesman/philosopher for the handmade pot and pottery ‘tradition’, but one only needs to look at the extensive lineage of potters that Leach has influenced both in the UK the US and around the globe to understand his immensity…. both then and now – to this day in the 21st century. I am an art critic. So I look at the art. You can’t win a prize for art because you wrote books. Leach made some great pots but mainly they were dull and lacked originality. Imagine no Sung Dynasty and as a result no Leach. I really find the ceramic attitude of not making value judgments about aesthetic worth because it will disturb our community to be unprofessional. Imagine if writers felt the same and tried to prevent any tough, opinionated literary criticism. If you are into ceramics for lifestyle, fine. But if you are looking to promote excellence in our field our criticism needs teeth. Also it is not just my opinion, my guess is that 90% of modern ceramics historians agree. What a treat for you to find this collection and the backstory on this great potter. Thank you for sharing and giving us a new perspective to consider. Thank you, thank you, thank you!!! What a wonderful article and what inspiration! I have always been suspicious of Leach, and I am glad that he is finally off the high pedestal. I am sure he deserves our attention for one thing or another, but it must be known what disservice he made to British pottery. Most importantly, though, thank you for bringing Murray’s work into the light. Actually, I am a little disappointed to see Leach denigrated. Regardless of Leach’s personal shortcomings, there is no reason to refer to him as “the lesser man” or to use other disparaging terms in such a final, judgmental manner. Leach accomplished much during his life, and whether or not he was at times envious of others or yearned for status, it seems we need to acknowledge the positives. Was Murray without fault or jealousy? A reasoned criticism of both men would be much preferable to such a one-sided piece. What a disappointment to learn about the dark side of Bernard Leach, but what a treasure to read about the resurrection of Staite Murray’s pottery. The “Standing Bhudda” is magnificent, and the the coral and green pot in the last photo is amazingly contemporary. Thank you for your article and your photos. Wonderful article! Far too many exceptional individuals and their art are being lost to history. Perhaps this is the next book from the editor of CFile – who, BTW, gave an excellent talk at the Gardiner Ceramics Museum in Toronto in October. Well done – .